Stormwater. Not something you think about very often – unless it’s dripping through your ceiling! Gutters carry stormwater away from your home, but they can’t do it if they’re clogged with silt and muck. A gutter-vacuum is the best tool to use. It's fast and thorough, removing all sludge, dry dust and foreign objects. And we use such a beast here at the Fixician. We clean safely and responsibly, and keep a look-out for issues that might compromise your roof (like broken tiles, or overhanging branches). And we’re licensed and insured. 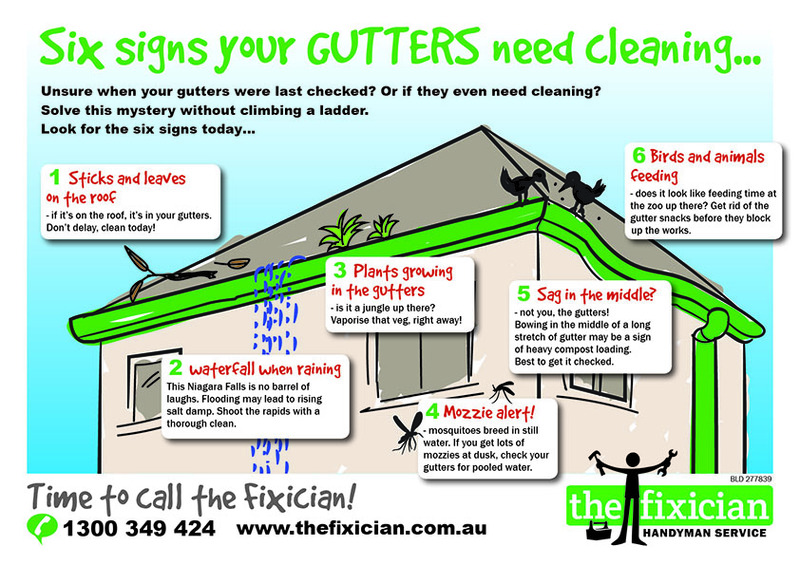 So if you’re worried about your gutters, or concerned because they haven’t been cleaned for a while, call the Fixician today. We offer a free inspection and quote, to inform you of what needs to be done.